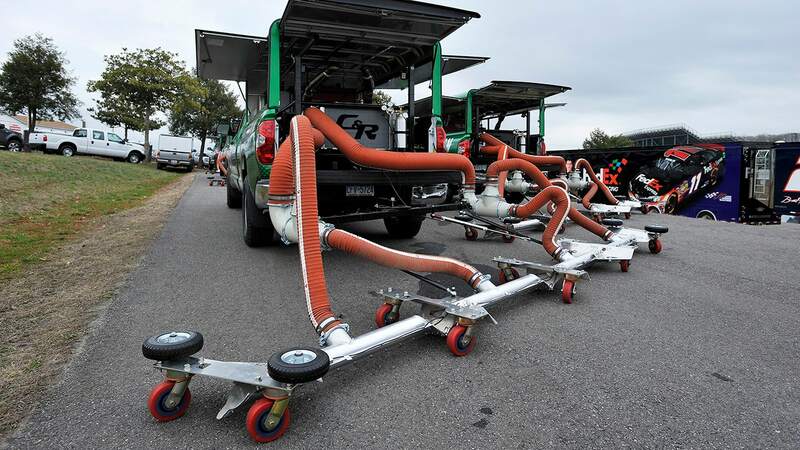 Friday at Martinsville Speedway, NASCAR rolled out its newest innovation, the Air Titan 2.0 track drying system. 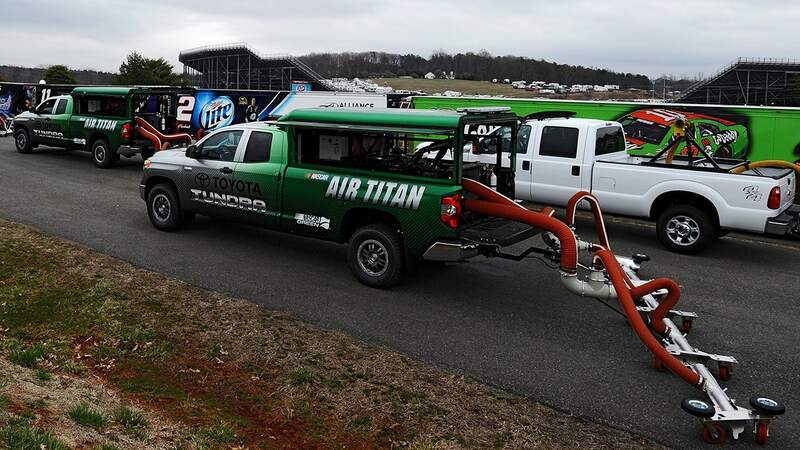 The Air Titan 2.0 is "a more compact, more nimble and more environmentally friendly version" of the original, which debuted at the start of the 2013 season. The big news is that the new and improved Air Titan reduces track drying time by about half, consumes nearly 80 percent less fuel and emits 80 percent less carbon dioxides. And 2.0 units fit in the back of Toyota Tundra pickup trucks, instead of having to be hauled around by tractor-trailers. 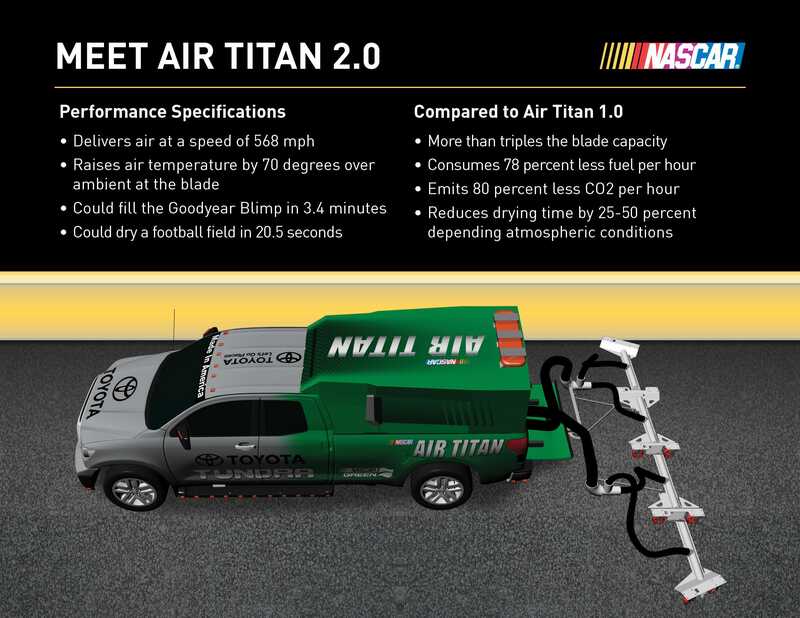 NASCAR will use as many as 21 Air Titan 2.0 units at larger tracks to speed the track drying process. "Developed by our engineers at the NASCAR R&D Center, Air Titan 2.0 will help us more quickly return to racing, which serves our most important mission – the enjoyment of our fans. It’s faster, more agile and eco-friendly," said NASCAR Chairman and CEO Brian France. "The new Air Titan creates the ultimate win-win-win for our sport, our fans and our environment." 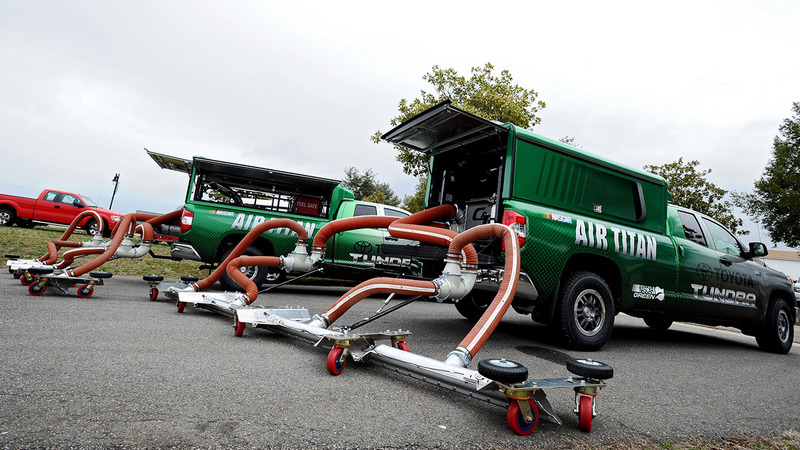 "The first phase of the Air Titan system has been an overwhelming success," said Gene Stefanyshyn, NASCAR vice president, innovation and racing development. "Based on our experience and learning, the staff at the NASCAR R&D Center has worked tirelessly to develop Air Titan 2.0. We will continue to innovate and develop the technology to further increase its efficiency and sustainability."